Bridges and viaducts serve the same purpose, and there are many opinions about their similarities or their differences. Dictionaries, like “Chambers Thesaurus” consider them synonyms. Some say viaducts are types of bridges; meaning all bridges are not viaducts but all viaducts are bridges. Let’s find out with the help of some facts what the differences could be between bridges and viaducts. Bridges are structures which are built to cross physical obstacles like a valley, water, or road. There are six primary types of bridges, and their designs are according to the function they serve, the material used, and the terrain over which the construction of the bridge takes place. Beam bridges–They have horizontal beams supported by abutments at each end. Beam bridges are typically not more than 250 feet long. Arch bridges–They have abutments at both the ends. The weight of the structure is supported by abutments on both sides. Cantilever bridges–They are built with cantilevers, horizontal beams which are supported on only one side. Suspension bridges–They use cables for suspension. Cable bridges–They are like suspension bridges but less cable is required. The towers which hold the cables are shorter than suspension bridges. Truss bridges–They are built of connected elements which are straight. Bridges are classified depending upon how the tension, torsion, compression, shear, and bending force distribute themselves through the bridge structure. Some of these forces are predominant in particular bridges though all the other forces are also in play. 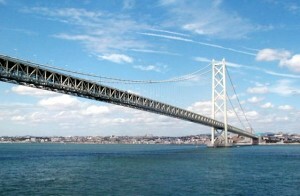 For example, Tension plays the most important role in a suspension bridge. Viaducts are a type of bridge that are made of multiple small spans. They have arches in a series. All arches are of almost the same length. They may be built over water or land. When made on land, they typically connect two points which have similar heights. They are also popular in cities which have railroad centers like; London, Chicago, Birmingham, Atlanta, etc. They are built for the crossing of freight trains over railroad yards and the railroad line which are multi-tracked. They are also used for railroads to cross large valleys or cities with multiple avenues and cross streets. Some viaducts are double-decked, meaning one deck has rail traffic while the other deck has road traffic. When built over water, they have to be combined with other tunnels and bridges. They are cheaper to build than bridges and tunnels which have large spans, and their height does not allow large ship clearance. Bridges are structures which span over land, water, or roads to facilitate crossing; viaducts are types of bridges which usually carry a railroad over the same terrain, but it is not always true. Viaducts have one or more arches and intermediate supports; bridges are of many types, and they don’t necessarily have intermediate supports or arches. Viaducts are cheaper to build. Their size sometimes does not allow clearance for big ships. Bridges are of all sizes. They can be long enough to connect two islands and high enough to allow any ship to sail under them. Nimisha Kaushik. "Difference Between Bridges and Viaducts." DifferenceBetween.net. 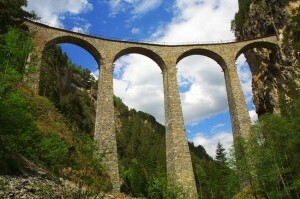 July 21, 2011 < http://www.differencebetween.net/object/difference-between-bridges-and-viaducts/ >. Yes! Finally someone writes about 1 hour heating and air conditioning.